On 16th Nov 2016 Microsoft announced the first Community Test Preview (CTP 1.0) of SQL Server vNext that will run both on Windows & Linux. Not only Linux, but it will be supported on Docker, and macOS (via Docker) too. This announcement was along with the release of SQL Server 2016 SP1, and the vNext version also supports features added in SQL Server 2016 SP1. To download the SQL Server vNext you can Register and Download the Full version or Free evaluation version (180 days). 1. All new features in SQL Server 2016 SP1. 2. New compatibility level 140. 3. Improvements to the way incremental statistics update thresholds are computed. – sys.dm_exec_query_statistics_xml added, to get query execution plan for in-flight requests. – sys.dm_os_host_info, to provide operating system information for both Windows and Linux. 6. Clustered Columnstore Indexes now support LOB columns (nvarchar(max), varchar(max), varbinary(max)). 7. New STRING_AGG() aggregate function has been added. 8. Database roles are created with R Services for managing permissions associated with packages. 9. New Japanese collations are added. 12. New string functions CONCAT_WS, TRANSLATE, and TRIM are added. – and the WITHIN GROUP clause is now supported for the STRING_AGG function. 13. Online index build and rebuild support for non-clustered Columnstore indexes. 1. 1400 Compatibility level for tabular models. 2. Modern Get Data query and import data features for tabular models. 3. Support for ragged hierarchies with the new Hide Members property. 4. Support for drillthrough by using Detail Rows. This includes the Default Detail Rows expression property and DETAILROWS DAX function. 5. Table-level security, restricts user permissions on table data and table names. 6. New DAX IN function. 7. Encoding hints, an advanced feature used to optimize processing (data refresh) of large in-memory Tabular models. – Support Scale Out of SSIS: to run SSIS on multiple machines. With Scale Out Master and Workers, packages can be distributed to execute on different Workers automatically. Check more details here in MSDN. >> SQL Server R support: Check full details here in MSDN. –> For new Features released in CTP 2.0 check here. SQL Server 2016 RTM full and final version available – Download it now !!! This Developer version is meant for development and testing only, and not for production environments or for use with production data. For more info please check my previous blog post. From now onward SSMS i.e. SQL Server Management Studio will not be part of SQL Server installation. This has to be installed separately via the SSMS download page, or from the Installation Center which will download SSMS from online. As per Microsoft, this is basically to support the move to make a universal version of SSMS for both SQL Server on-Prem & Azure SQL Database, that will ship every month or so. 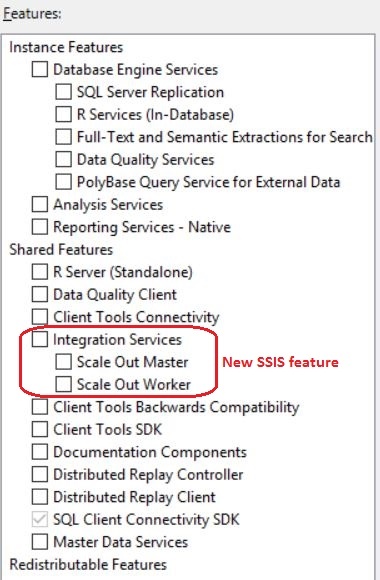 Check my previous post on installing SSMS separately. 11. Other features like, IF EXIST with DROP stmt, STRING_SPLIT fn, COMPRESS & DECOMPRESS fn, etc. In my [previous blog] post of SQL Server 2016 RC0 availability, I mentioned regarding SQL Server Management Studio (SSMS) that it will no longer be installed from the main feature tree of SQL Server engine setup. As per Microsoft, this is basically to support the move to make a universal version of SSMS that ships every month or so. So, now on wards after installing SQL Server 2016 you need to install SSMS separately. Or, try installing directly via the “Installation Center” as shown below. This will install SSMS directly online. Tech Tip: Move your SQL server onto the cloud with Hosted Citrix VDI available unbelievable citrix xendesktop pricing and get an easy remote access to it from anywhere on any device(PC/Mac/Linux/android/iOS) powered by one of the leading providers of cloud hosting – Apps4Rent.